An agogô (Yoruba: agogo, meaning bell) is a single or multiple bell now used throughout the world but with origins in traditional Yoruba music and also in the samba baterias (percussion ensembles). The agogô may be the oldest samba instrument and was based on West African Yoruba single or double bells. The agogô has the highest pitch of any of the bateria instruments. Excerpts from the website CANDOMBLE - Uma Religião sem Mistérios a Serviço do Povo. A magical energy, the universal sacred of the orixá. A powerful energy that is always neutral. Manipulated and directed by men through the orixás and their symbols and/or elements. " The most precious of Ilê*, axé is the force that ensures dynamic existence.It is transmitted, should be maintained and developed, as all forces may increase or decrease; and this variation is related to the activity and conduct of the ritual.The conduct is determined by the scrupulous observance of the duties and obligations of each holder of axé, yourself, orixá, and Ilê.The development of individual and group axé affects the axé of the Ilê. 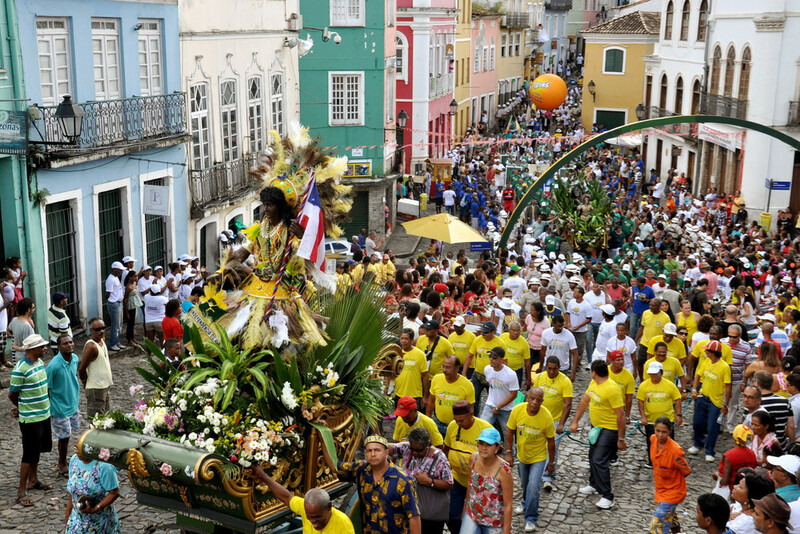 "The axé is connected to the initiated, and directly proportional to its ritual conduct - the relationship with his deity, his community, his duties and his babalorixá (priest of candomblé)." The strength of the axé is contained and transmitted by certain elements and material substances, is transmitted to humans and objects, maintaining and renewing the powers of accomplishment.The axé is contained in a variety of representative elements of the kingdoms: animal, vegetable and mineral, water (fresh and salt), earth, and forest (untamed vegetation or urban space).It is contained in the natural and essential substances of each being whether simple or complex, living or dead, that make up the universe. Every ritual act and offering involves the transmission and revitalization of axé.To be truly active, these ritual acts and offerings must come from the combination of those elements that allow for a specific result or achievement. To receive axé means to incorporate the symbolic elements that represent the vital and essential principles of all that exists. "Aché (Axé, Asé) is the magic force that moves all things in the universe according to the African religions in Brazil. It exists in all realms of nature and can be transmitted through specific rituals. Although Capoeira has no direct connection with religion, the capoeiristas, as the majority of Brazilians, are related one way or another with Afro-Brazilian rituals. Aché in Capoeira means the connection with the roots, a special energy to be developed by any capoeirista. To wish aché to someone means to wish good luck. For those who believe, some special people transmit aché through their wishes." p.6 Almeida, Bira(Mestre Acordeon). Capoeira: A Brazilian Art Form. Berkeley, California: North Atlantic Books, 1986. Print. Babalawo is a priest of Yoruba religion. For people who have a problem with blood sacrifice, eating a chicken sandwich is no different. Axé (Àse, in yoruba spelling) is one of those words that I always heard as a kid but never translated. As far as I was concerned, translation was pointless because the context of its use was quite foreign to "western" cultures. The word usually came up in call-and-response exchanges between a priest/medium and a supplicant. The supplicant would bring a sacrifice or offering to the medium who would then present it to the gods. During the presentation, the medium invokes the blessings of the gods on behalf of the supplicant. The supplicant responds with "Àse" after each invocation. The simplest such ritual involves a medium pouring out libations in celebration of some important cultural event. So I guess in my mind, "Àse" is just a word used to claim the blessings of the gods; very much similar to the way christians say "amen" after a prayer. I hesitate to refer to the context as "Yoruba religion". To the "un-westernized" yoruba person, the gods, libations, sacrifices and all things spiritual are an inextricable part of life. The spiritual laws are simply part of the mechanics of the observable world - the physical laws are not enough. In that sense, I contend that it's just Yoruba culture. That's my take on it. I don't know how it applies to capoeira. I have always been puzzled by its widespread use in Brazilian hybrid religions since I assumed (probably incorrectly) that the majority of slaves in Brazil were not acquainted with Yoruba culture.